Tammy Jahn, pictured third from the front with members of her team, was diagnosed with breast cancer in 2008 and has been cancer free since June of the same year. She has walked with supporters and survivors in the Susan G. Komen 3 Day Walk for three years. In 2008, a routine check-up at the unassuming age of 37 led to Brandon resident Tammy Jahn hearing a specialist utter the words, “You have breast cancer.” This year she celebrates three years cancer free and is gearing up for her fourth Susan G. Komen Walk for a Cure with 17 members in tow as the team, Tammy’s Twins, aiming to raise a total of $25,000. Each team member is required to raise $2,300 to participate in the walk on Friday, October 28- Sunday, October 30. Jahn has raised 85 percent of her personal goal totaling $1,946, however the collective team is still inching its way from its 59 percent totaling $14,734 to the $25,000 goal for all 17 team members to walk. Since the kick off of her team which grew to 17 from just three women, Starbucks located at 11029 Causeway Blvd. in Brandon has encouraged customers with a booth to support their local team and to donate to Tammy’s Twins. Upcoming fundraising events will take place throughout the month of August. The first will take place Saturday, August 13, from 7 a.m.-12 Noon. The team will be at Starbucks for questions and donations. Jahn endured five surgeries and a double mastectomy throughout her journey with cancer, just two short months later; she was walking the 60 miles in support of hope toward a cure. “Breast cancer does not have to be a death sentence and you can overcome it,” she said. The light that broke through her stunned silence upon hearing her diagnosis was the doctor’s reminder that attitude is everything. “I knew right then that I would be a glimmer of hope for anyone that I came in contact with,” Jahn said. Without early detection, Jahn would not have made it to her 40th birthday. “Being 37 and also being told many times that I was too young for cancer meant that I didn’t have many places to turn for information about breast cancer,” Jahn explained. 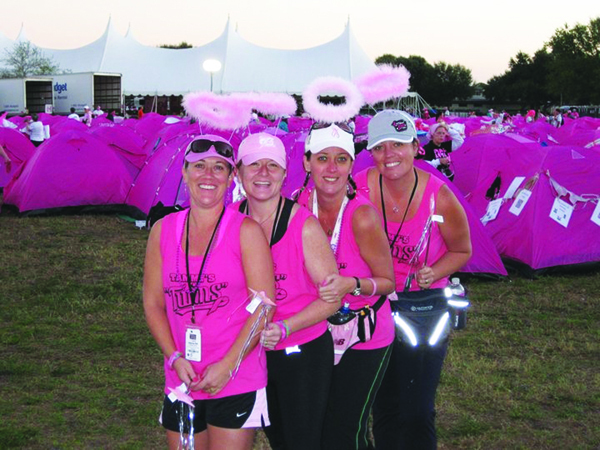 The Susan G. Komen 3 Day Walk for a Cure gave her the network of resource, support and motivation to become a survivor. “We [her sister and her] were overwhelmed by the women that shared their stories and for the first time I was able to ask all the questions people don’t talk about,” she said.